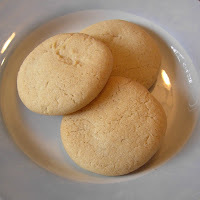 Well today's taster is an old local recipe I thought it would be nice to share it with you. Cream the sugar and butter together. Beat in the egg. Sift the flour, bicarbonate of soda, baking powder and ground ginger together. Fold into the creamed mixture. Make into small balls or drop by teaspoon onto an ungreased baking sheet. Bake at 150 °C / 300 °F / Gas 2 for 20 minutes or until light brown. During the old coaching days Grantham was one of the stopping places of the Royal Mail Coach and while the horses were being changed at the George Hotel, passengers would stroll down the street and invariably purchase a supply of Grantham Whetstones, which were the first form of biscuits ever offered for sale. Then in 1740, a local tradesman, named William Egglestone, made an accidental discovery. In bygone days business premises were always closely shuttered and as part of Egglestone's business was that of a baker, he went into his shop one Sunday morning to get the ingredients for making some cakes for his family. In the semi darkness of the shop, he mistook one ingredient for another and it was not until the cakes were baking that he discovered his mistake. The little cakes before being placed in the oven, were cut out with a wine glass and should have remained that size when baked, but instead of which they rose up and became nearly twice the size. Anyway once they had finished cooking he and his Family decided to try them and found that they enjoyed the delicate flavour so as a result offered them for sale in his shop calling them 'Grantham Gingerbreads'. Grantham gingerbread is unique in the fact that it has no molasses in it making it a white ginger bread with a much creamier texture, it is not really a biscuit or a bread...in fact it's kind of hard to describe so why don't you make yourself a batch and see how you like them??? If you ever come to Grantham however you will not find them for sale....They can be bought at the mid lent fair when they visit so they are obviously made somewhere but are not found locally in bakeries. Years ago they used to be made and sold at a place called 'Catlins' who were actually the successors of Mr Egglestone and still occupy the his original premises built on the High Street in 1560. They may still be sold there but as of yet I haven't checked but I will let you know!! There is much to do...after all it's spring...but with the recent weather nothing is happening outside so I still haven't managed to get my broad beans in yet...the ground here is very heavy and wet due to the amount of rain. I have to say I am confused on the hosepipe ban...our soil was lovely and workable before the rains...not too heavy and just wet enough to be able to plant without watering in. Now with the recent rains we have puddles collecting on bare earth and it's impossible to even walk across the plot to just pull a weed up...and we are told the ban won't be lifted before December no matter what the weather. I guess moaning about it won't really get me anywhere though....I've tried praying but I'm not having much luck with that either!! Anyway I will get the beans in the ground by next weekend no matter what mother nature throws at me but I am dubious about sowing my seeds straight to ground and fear that my potato tubers could end up rotting away below the surface at the rate the rain keeps coming!! So what have I been doing to keep me busy then??? Well a bit of knitting, playing my DS, some catching up on a bit of TV....and then some reading to put in future posts. I didn't start the reading with posts in mind but I have been researching some things and I thought as I learn about bit's and bobs I will share it with you...after all you may or may not know it...and I guess you may or may not be interested...but I will write it anyway...if you start to get bored of me than just tell me to shut up or put up some photos instead...i really won't be offended!! Oh I also helped out at the allotment shop yesterday...one of the many perks (lol) of becoming a committee member...but I did end up with some free cabbage seedling and a freshly harvested cauliflower so it wasn't too bad of a deal!! No pictures for you today...I figured everyone is probably as fed up of the rain as I am!! Well again i had some fruit which was a little over-ripe so I decided to make a fruit crumble for dessert. Pears were the main fruit but I had a couple of 'softish' apples to so they got chucked in with it. First peel all your fruit and put in your chosen dish and then sprinkle with sugar and cinnamon. If you wish to you can cook your fruit first but I prefer mine cooked only in the oven. Crush your ginger nut biscuits ready to add to your prepared crumble mixture. Rub flour sugar and butter together until you reach the required consistency for you crumble and then add the biscuits and stir. Put mixture on top and place in oven. I put this on the middle shelf on gas mark 4 for about 40 minutes. Take from he oven and either serve immediately, when cold or even re-heated the next day. I like mine warm with some fresh cream but you can have ice-cream or custard if you prefer!! The ginger biscuits just add a little extra something to the crumble mixture and give it a bit of extra taste. I'm not one much for following a recipe...I just tend to add what I fancy at the time!! Well due to not being very well I didn't get my forecast up yesterday or get the rest of the manure moved to the allotment but today I feel a lot better than I did and so I took the opportunity to get the manure sorted , get some seeds in and get the rest of the potatoes planted so I am feeling a lot happier now that I have accomplished everything I wanted to over my period off work!! First let's talk about the weather...well it has been an unsettled week with storms coming over frequently and dumping hail and rain on us as well as letting us here some thunder. Temperatures have been between 8 and 10 degrees which is slightly below average for this time of year although it has been warmer when the sun has come out. A couple of frosts over night but nothing major...oh and we are still on a hosepipe ban!! Whilst I was there the Hail came down hard. I managed to get down the allotment today and get the rest of the potatoes in between hail and rain showers. I now have three rows each of new and old potatoes. In an aim to find a new potatoes I am really happy with I have five varieties planted this year. Penland Javelin as a main and then five tubers each of Charlotte, Anya, Swift and Nicola so i will give you taste, texture and yield verdicts later in the season. For my old potatoes this year I have Picasso, I've never tried these before so this is a first for me..again I will keep you updated, oh I will also be planting 10 Melody main crop tubers when they arrive which were a freebie. Can you see the hail in the tubs?? It was over quite quick though! I also got the beans below from the allotment shop today..I'm not sure what they are but I thought I would give growing them a go so I could find out....anyone ever seen them or grown them before?? I am told they are like a French bean !! I kept myself busy during the hail and rain showers by getting these beans sown today and also sowing the sweetcorn and Baby-corn. I am hoping to get the brassica's sown tomorrow and if the weather is feeling kind I might even get the chance to sow my root veg straight into the ground but I won't hold out any hope for that one !! I didn't plant a lawn here?!?! As you can see it's a complete mess so the whole lot HAD to come out...roots and all!!. Having removed the gravel and the weeds then the whole thing had to be dug over over the VERY 'clayey' soil worked into submission. It wasn't an easy task working between the showers but by the end of the day this is what I had. Now I just have to make two decisions....What should I plant here and should I move the bird table to the middle of this bed??? I am half thinking that apart from the thistle that I have left I will put bedding plants in each year to give a lovely summer display and then work the summer each autumn so as to lighten it up and get rid of some of the stone. If I do that I think the bird table being in the centre would be nice as it would break it up...this would also mean I could fill the lawn in again...any thoughts appreciated!! In our house we eat a lot of fruit...but sometimes it ends up a little over ripe like these banana's you see here and I hate to waste them but we only like to eat them on there own whilst still firm so that is when we start making milkshake!! Making banana milkshake is very easy and the beauty of making your own is it's nutritious and has no additives or sugars in it which makes it a wonderful thing to give to your children!! Then half fill your glass with milk and then put banana and milk in a jug and blend with a hand blender. And hey presto you have fresh creamy milkshake!! The milkshake has a wonderful texture and is think and creamy. Any milk can be used though I use green/semi-skimmed milk. Great for the kids and adults too!! Oh and just to let you know...managed to get down the allotment today and get that final bit of weeding finished before the heavens opened up!! Pleased as punch as the plot!!! Well having a week off work has certainly helped out with getting the allotment sorted and I am very proud with the progress that I have made and even more pleased that I still have a week left off to get the last bit f weeding done and to get some more seeds sown. Anyway I didn't think you'd want me to drone on forever so I took lots of pictures for you to look at instead!! One half of my allotment. So this is the first half...nicely weeded and raked. I have managed to plant out my onions here too...a row each of red and white. Second half of the allotment. This is the second half. The bricked area is awaiting the strawberries I have ordered and I have put in my potatoes now. Pentland Javelin for my earlies along with a few tubers each of Charlotte and Swift. All the tubs have been sorted and the Greenhouse area tidied and weeded. I have also now removed all the manure to the manure heap and sorted out the cold frame and raised bed. My pond area is nicely getting wild with lots of wild flowers coming through and there is some frog-spawn present too. I am really happy with how this is growing and I will sprinkle some more seeds round here too to add to the collection of bugs that visit. The rhubarb is coming on nicely and I will soon have to pick the stems before they get too stringy. As you can see I have plenty of manure in the background in storage for next year!! Well I still have the same debilitated shed but it does the job so I shan't bother changing it any time soon!! All the fruit bushes are coming into bloom ...not I just have to keep my fingers crossed for lots of lovely fruit!! Notice the empty pot?? Not sure what to put in here so any ideas will be welcome! Weeds left to be dug out. And finally I have took a photo of the weeds I have yet to dig out...just to prove to all my readers that I don't always have a wonderfully tidy plot...after all nobody is perfect! So that is what I have been up to over the last week. There is still plenty to be getting on with but I am really pleased with how things are progressing and I really think that as the years go on maintaining the allotment gets a little easier with the things I am putting into place. I'm hoping to get those last weeds out this week and to get some more seeds sown in the greenhouse too. Hope you've all had a great Easter and hope that the weather has been kind to you so that you have been able to enjoy your bank holiday weekend!! Oh and have you noticed how all my photos aren't in a straight line?? I think I may like this new blogger after all!! Well as you can see from above...this morning we have a lovely clear sunrise to view though there is quite a bit of frost outside but I'm hoping that the sun soon burns it off and warm the air. Met Office were true to their word last week with the weather taking a downward turn getting cooler over the weekend until we received horrific rain sleet and high winds on Tuesday night and all through Wednesday. In the East Midlands we weren't hit too bad but some places in the U.K. ended up with 4ft of snow!! Thursday morning saw clearer skies and calmer winds once again with a creeping rise in temperatures...The weather man assures me we are now at average temperatures for this time of year but 9 degrees Celsius sure seems cold after 24 degrees Celsius just last week!! Obviously not much has been done on the allotment but I am hoping to get down there this afternoon and fingers crossed the weather is kind to me!! Any snow in your neck of the woods?? Well this was a fun one to do as usually I don't measure out my ingredients for Yorkshire puddings. I have a scoop for the flour and then everything else is just a dash of this and that , but, purely for this post I attempted to weigh and measure what I use. I always make my own Yorkshire puddings and there are variations which can be done so this is my version and some variations are put in brackets for you too. Set your oven to high and get it nice and hot. Pick your chosen pan and add your fat, I have used olive oil here but you can use stock from your meat or lard depending on taste. Put enough in to coat the bottom of your pan and put in the oven on the top shelf. Add all of your ingredients into a bowl except the water and beat well. Then add a splash of water to thin the mixture slightly and beat again. When your fat is VERY hot remove the pan from the oven and pour mixture into the pan. Make sure you shut the oven door whilst doing this to keep the heat in. Return pan to the oven on the top shelf and cook for about 20 minutes. Voilà! 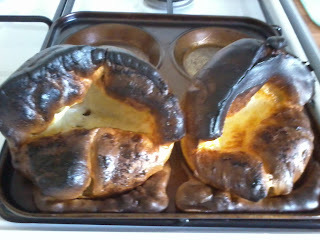 Home made Yorkshire puddings!! Serve in any way you wish and Enjoy. This mixture make enough for about 6 small or two medium sized Yorkshire puddings. Obviously you can double the mixture if you wish to make more or are wanting to make bubble and squeak!! So this is how I make my Yorkshire puddings. Quick, simple and tasty! !